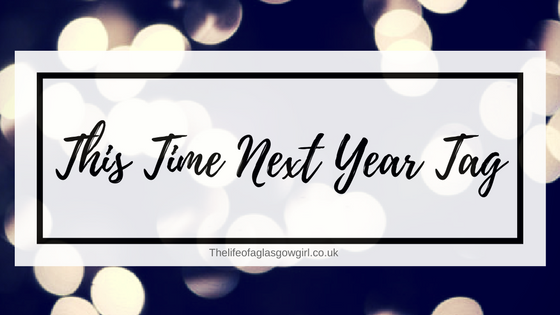 I was tagged by the lovely Kim from kimberleyjessica.co.uk to do the "This time next year tag" and I was super excited because I LOOOOVE getting tagged for these post's. Admittedly it was a few weeks back and I am a little late in doing this... But I haven't been feeling great so I didn't get around to doing this earlier, So sorry! Anyway, Let's get on with this shall we? So here we go then! I will have passed my driving test! I will achieve this by taking more lessons, booking my test and staying confident! I will have booked my tickets to Canada to go celebrate my grandpa's birthday with him! And Leon will get to explore my faviourite place in the world. I will Achieve this by booking them in the summer this year! I will finally be eating healthier. I will Achieve this by being more strict with myself and actually sticking to my plans. I will Finally have my hair sorted the way I want it! I'm not sure exactly what I want to do with it yet, stay dark or go a little lighter but I do know I need to make a decision on style etc... because now it is getting so wild. I will achieve this by spending time thinking about exactly what I want and the look I want to achieve. I will have travelled a little more. I will achieve this by going on holiday in may, going to Slamdunk in leeds, travelling to london again, having a stay over in edinburgh and much more! Some lovely goals here! I'm sure you'll be able to achieve them all. You're more than capable and I wish you the best of luck! I love this tag, I did it on An Ocean Glimmer too. Best of luck with your driving test, Jordanne! It's a really scary thing to do, but it's the best feeling ever when you pass! FREEEDOOOOOMMMM hehe! Your travels sound like such fan as well, I'd love to go to Edinburgh! I hope you'll be blogging about your experiences! Really liked reading this, Jordanne. Good luck with passing your driving test, I have all the faith in you! Thanks for tagging me in this, I can't wait to do mine! So many goals!! Passing my driving test was definitely one of the best days of my life lol. I was in shock for days after. Also I'm really wanting to do more travelling this year too! Good luck for the driving! If I can do it - anyone can!